Flaunt your inimitable style sense with the women’s Arcopedico wedge sandal. 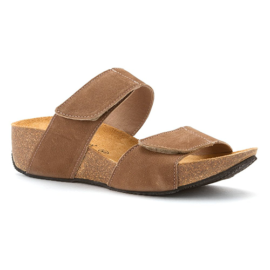 Designed with leather upper, this wedge sandal has dual adjustable Velcro straps for an optimal fit. Its contoured footbed cradles your foot all day long. The perfect icing on the cake to this sandal is its rubber outsole with a cork wedge heel that is slip resistant and offers maximal grip for every stride. Choose the women’s Arcopedico wedge sandal for its fabulous look and practicality.